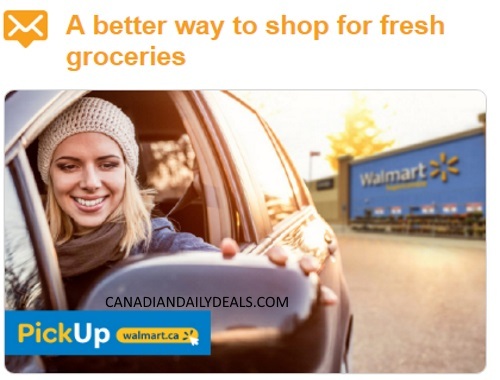 Bzzagent has a new campaign for Canadian Members for Walmart Pickup! "There’s a better way to get your weekly shopping done. Instead of packing the kids into the car, do your shopping from home with Walmart PickUp. Order your weekly groceries online at the same low prices you love in store then a Walmart employee will fill the cart for you. They’ll even load up your car at a convenient Walmart location during the timeslot that works best for you!" Wow! Get a Free $20 in grocery credit when you join this campaign to try Walmart PickUp. In order to participate in this campaign, you must create a Walmart account and be willing to purchase groceries from Walmart. If you are unable or unwilling to sign up for an account and purchase groceries, please do not join this BzzCampaign. I was so excited to be chosen for this however when I tried to join the campaign, I got a message that it was already full! It was probably my own fault though since I did get the email hours ago. Just shows you, if you get invited to a campaign, make sure you accept asap! Were you chose for this campaign? Let us know on our Facebook Page. Click here to join Bzzagent/log into your account.